Does your preschooler have iPad envy? 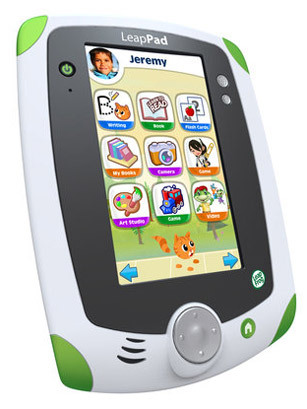 Try Leapfrog's LeapPad Explorer, a tablet for the younger set. Powered by four AA batteries, the LeapPad comes complete with touch screen, microphone, gaming control pad and a camera. Run on Leapfrog's catalog of Leapster Explorer cartridges, the tablet allows tech savvy kids to read books, play games and listen to music and just might be interesting enough to lure kids away from mom and dad's device. Also available this year is V.Tech's InnoPad, the tablet sibling to its V-Reader that downloads content straight from the company's new electronic entertainment store, the Learning Lodge Navigator. See the top 10 toy crazes.